Google is one of the most prominent companies in the world, especially on the Internet; Google’s rise to the top is due to good ole’ fashioned innovation. Rather than ranking searched results by how many times search terms appeared on the page (the strategy of most search engines at the time), Google was a search engine technology that ranked search results based on the number of pages, and importance of those pages, that linked back to the original site (Page, et al., 1999). Google has been a technology giant for a while now, and its tremendous user experience might be a significant contributor. It might be the most powerful UX on the Internet. There are many components that assure a user’s successful experience with a system. Over time, UX and human factors professionals have compiled various principles that, when correctly incorporated into a system, lead to a strong user experience. Google has masterfully accomplished this. Google’s algorithms may not be simple, but its homepage is. And according to William Occam, simpler usually means better. Google’s main search page is quite barren actually, and it always has been. With the exception of the occasional celebratory Google Doodles, we can nearly always bet on the classic blue, red, yellow, and green Google logo and one search bar. As far as an Internet search goes, that’s about it. What does this mean for users? Not only is the site aesthetically pleasing, but it also allows the user to focus on the task at hand. There aren’t useless advertisements or content-rich space to distract users from getting the job done. While the human attention span is an extraordinary thing, human working memory can be degraded by even the smallest of details. Amazing in some regards, but limited in others. The key is distraction. Advertisements and heaps of actual content can make the user’s interaction with the site more complicated than it needs to be. While other popular sites like Facebook, Yahoo, Wikipedia, and YouTube have very busy pages, Google holds onto that white space for dear life; it remains crucial for users to focus on what’s important in their website experience. Accessible design is one that not only caters to various personas but also demonstrates strong adaptability when the unanticipated comes along. Internet users worldwide enter search terms with varying levels of literacy, education, and language; widespread usage brings with it an abundance of diversity. It is up to Google to deliver helpful results based on a few words typed into a search bar. It is a tough job, but Google does it very well. To bring these principles to life, consider an example. Suppose you’re a middle-aged male who is a budding culinary chef. A total foodie. In fact, you’re so dedicated that you managed to get your hands on an original Easy Bake Ultimate Oven “for your daughter.” The problem is, all the original instructions are missing as you bought it from a neighbor used. In order to determine how long your cookies should remain in the oven, what do you do? You Google it, of course! An experienced Internet searcher would know that your best bet for finding the answer to any problem is through Boolean query strategies. They help users to speak the search engine’s language. But alas, not everyone knows Boolean search terms, so many people write their full question in the search bar (e.g., “How long does it take to bake with the Easy Bake Oven?”). Accessibility and Adaptability strongly contribute to how user-friendly Google is. We don’t have to think about what to type or how to type it because the algorithms do it for us; they are advanced enough to understand our complicated vernacular. Furthermore, consistent positive interactions generate a certain level of trust that even the occasional slip-up can’t undo. Similarly, Google provides a very forgiving interface for its users. The ideas of adaptability, accessibility, and forgiving designs all go hand-in-hand in this particular example. ‘Forgiveness’ is the fact that Google helps its users to avoid making mistakes, and if an error (usually a typo) is indeed committed, also helps to resolve the problem effectively. The primary example, of course, is Google’s “Did you mean…? feature. We can see that I had typed “jacob nielsen” in the search bar. 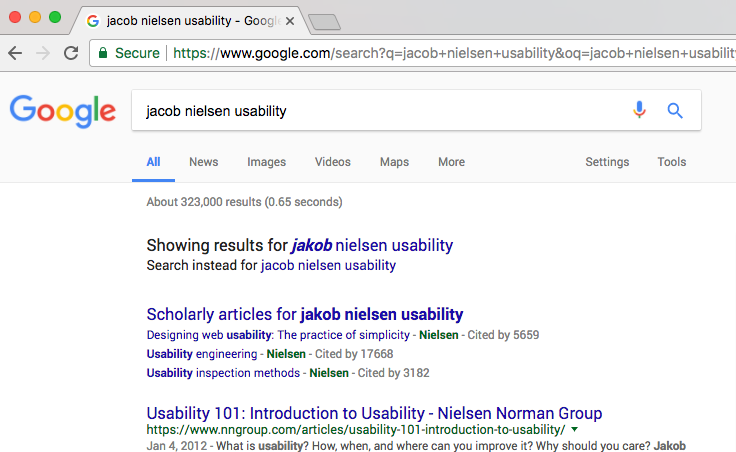 Because this is the incorrect spelling of Jakob Nielsen’s first name, Google provided a few suggestions just underneath the bar. Similarly, even though I did not click on any of Google’s suggestions and pressed “Search” anyway, Google went ahead and displayed the results for what should have been the correct spelling. The job got done despite the user’s error. Google then offers an option: “Show results for [correctly spelled query]” or “Search instead for [whatever the hell you typed in]” just in case you entered the query in correctly the first time around. Change is an interesting concept for all of us. While some embrace change openly, others flounder in it. When it comes to user experience on the Internet, innovative changes must be deployed with extreme caution despite being categorically necessary. Germaine Satia of Infinvision.com writes, “In user experience it could be said that familiarity breeds happiness. Or at least it breeds less head scratching. The more familiar we are with something, the less our cognitive processes have to kick in and figure out how to respond to that something” and she is absolutely right. Change creates the head scratching she refers to, and that’s because every time a website is altered in some way, we have to figure out how to use it all over again. Google’s search engine hasn’t changed a bit. It’s familiar to all of us. While every other website in the world must consistently update in order to stay fresh and keep users interested, no one is going to stop using Google’s search anytime soon. We know Google. You type your query into the search bar and click the “Google Search” button. Unless you’re one of those preposterous free spirits who uses “I’m Feeling Lucky,” that’s about it. That familiarity improves the user’s experience. Google is reliable. It just works, every time and all the time. Google’s users trust the service. The fact that Google is never down and churns out helpful query results on a consistent basis is something that many people take for granted. Glitches or poor quality performance critically affect the user experience of a website or an app. Why would a user stay when the next guy in line has a product that does work? Google, though? Tried, tested, and trusty Google never lets us down! It is reliable and that is a way bigger contributor to its user experience than people realize. Perhaps a cause of overwhelming success in the tech industry, Google provides the most powerful user experience on the Internet. We can quickly analyze which usability principles are most prominently creating a strong experience for the user: Independent of the user’s demographics, Google offers familiarity and reliability in a web environment that is constantly changing. Equally as important, Google successfully helps users find solutions to the problems and questions they pose, developing a strong sense of trust that further improves the User Experience. From simple to familiar, accessible to adaptable, Google does it all. Nielsen, J., & Molich, R. (1990). Heuristic evaluation of user interfaces. Proc. ACM CHI’90 Conf. (Seattle, WA, April 1-5), 249-256. Page, L., Brin, S., Motwani, R., & Winograd, T. (1999). The PageRank citation ranking: Bringing order to the web. Stanford InfoLab.